Having assessed your risk of osteoporosis your doctor may arrange for you to have a bone density scan to assess bone mineral density. This is also known as a DEXA scan (dual-energy x-ray absorptiometry), a special type of x-ray machine used to measure bone mineral density in the spine and hip. 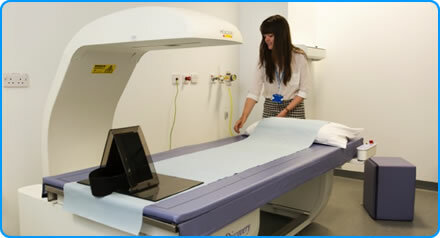 It is quick, painless and far better than normal x-rays at identifying osteoporosis. Bone density scans are very useful in the diagnosis of osteoporosis, but are not perfect. They were designed for use in post-menopausal women so the interpretation of results in younger women and men may need referral to a specialist.